The WAF Traffic report provides visibility into WAF traffic volume and requests processed in your environment, including WAF traffic per day measured by request or data size (in MB), and an appliance list with traffic requests and data size. Use this report to support WAF configuration and optimization efforts in your environment. In the Alert Logic console, click Reports, and then click Service. Click Capability Usage, and then click WAF Traffic. To refine your findings, filter your report by Date Range, Customer Account, and Appliance Name. The bar graph displays the daily traffic volume in the selected filters. You can display the data as a line or bar chart. Click the Chart Type drop-down on the top right of the graph, and then select the chart type you want to see. You can also view the data measured by request or data size (in MB). Click the Measure by drop-down, and then select how you want the data measured. The list displays the daily traffic volume by request and megabytes processed by the WAF appliances in your environment for the selected period. 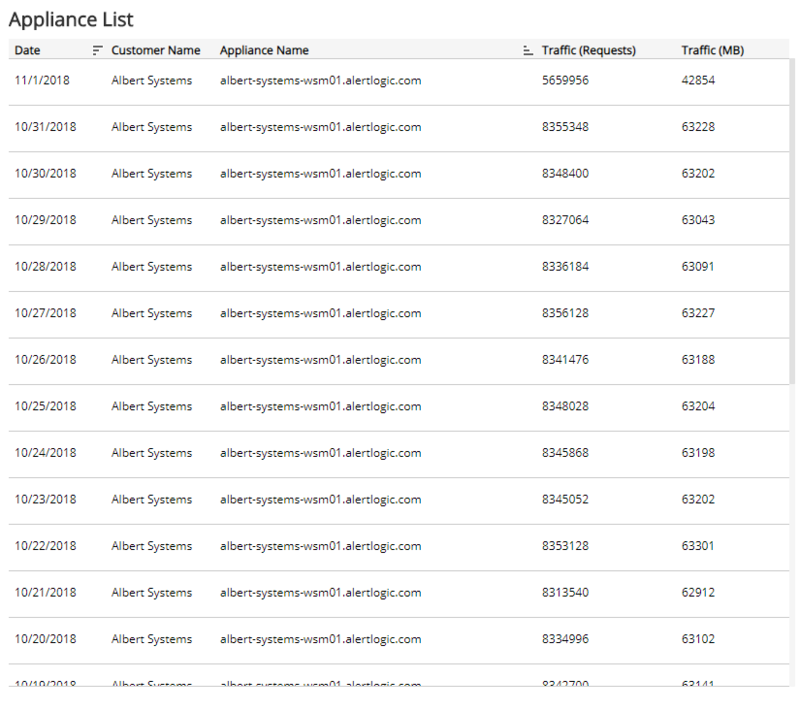 The list is organized by date, customer name, appliance name, traffic requests, and traffic (in MB).